Does Your About Page Pass The "TMI" Test? This episode is the first in a 3-part series on communications that I developed with my good friend Nikki Elledge Brown. Nikki’s known online as The Communication Stylist® and creator of A Course About Copy® and she’s on a mission to help entrepreneurs communicate with more clarity and confidence. In today’s episode we’re talking about your “About” page, and practicing the art of “strategic self-disclosure.” That means connecting through stories and sharing more about yourself as a person, but with a clear purpose. Here’s a simple fact: People aren’t going to trust you unless they like you. They can’t like you unless they know you. And they can’t know you unless you tell them some things about yourself. Last but not least, with each new episode of She Takes on the World TV we now offer a FREE bonus worksheet, exclusively for our amazing tribe of subscribers. 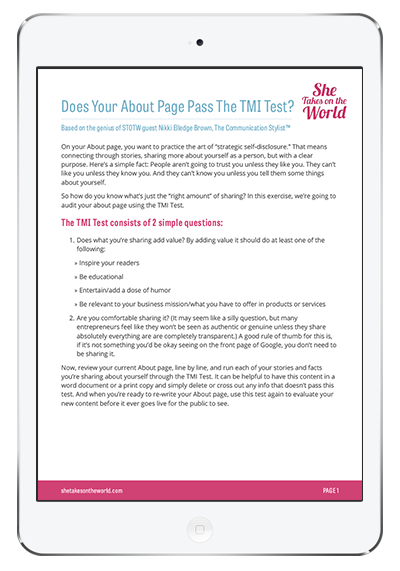 This week’s PDF download is “Does Your About Page Pass The TMI Test?” – a worksheet you can use to audit your own About page and help you connect with your audience in a clear, strategic way. My actionable for you this week is to watch the episode and then use your worksheet to audit your own About page. Be sure to leave a comment on the episode below and let me know if you have any questions about this exercise. P.S. Love this episode? We’ve got a sweet bonus for you! Click here to download your free Copy Cheat Sheet and be the first in line to find out about A Course About Copy® She Takes on the World edition, Round Two in 2017. So glad you enjoyed it, Susan! Don’t be nervous. It doesn’t need to be perfect; it just needs to be shared. You can tweak + restyle as you go. First draft is always the hardest! 2. Provide context. Tell ’em who you want to reach, how you want your reader to feel, what you want ’em to know, what you want ’em to do. 3. Return the favor. Ideally BEFORE you ask buddies + peers for feedback, offer helpful constructive (honest!) feedback that serves them. Then they’ll feel GREAT about helping when it’s your turn. Wow this was fabulous! I went straight ahead to my about page to implement the tips. One question though, directing the reader at the end to work with me could sound a bit pushy, if you say “click here”, no? Is there a more ‘relaxed’ way of doing this? In general I say if you FEEL [pushy, salesy, cheesy, etc.] when you write something then it will come across that way to your reader, BUT – there’s a difference between clear + pushy in this case. If the pushiness is coming up because you’re leading straight to the WWM page, you could a) lead to something else that’s part of building your connection with them, and/or really highlight the benefit of what they’d get from working with you so the clicking is a DUH-obvious choice. Bottom line(s): With calls to action + everything else, clear + sincere is the power combo here. Help make your site easy to understand and navigate so the right people can tap into the goodness you offer in the way that only YOU offer it.